DALLAS (AP) — American Airlines pilots are seeking more training on an automated anti-stall system on certain new Boeing jets. The system is under scrutiny after a deadly crash in Indonesia. Southwest Airlines says its pilots are getting more instruction on recovering from stalls, but a spokeswoman says that training was approved before the Lion Air accident and is not limited to the new model of Boeing 737 that was involved in the Oct. 29 Indonesian crash. The developments came Thursday after Boeing technical experts met separately with pilots from both airlines. Indonesian investigators are probing whether pilots on an Oct. 29 Lion Air flight were overwhelmed when incorrect sensor readings activated the anti-stall system and automatically pushed the nose of their plane down. The Boeing 737 MAX plunged into the Java Sea, killing 189 people. The anti-stall system differs from those in previous Boeing 737 models. Pilots at American and Southwest say Boeing didn't explain the changes in the new plane's operating manual. Boeing says the MAX is safe and that there is a procedure for stopping the nose-down command. The Chicago-based company, however, is considering whether software changes in the anti-stall system are needed. Modern planes use sensors outside the fuselage to measure airspeed and the pitch of the plane's nose. The sensors can malfunction, however, and safety experts have suggested that Boeing will have to change the automated anti-stall system of the 737 MAX — which entered service last year — to prevent it from responding to a single erroneous reading. Southwest Airlines said all of its pilots are getting additional classroom and simulator training by the end of the year. Airline spokeswoman Brandy King said the training covers all its Boeing 737 jets, not just the new MAX model, and includes recognizing and reacting to situations in which the nose might be pointed too high, and unreliable sensor readings. She said the training was approved before the Lion Air crash. Boeing representatives met Sunday with leaders of the pilots union at Southwest. The union declined to comment on the meeting. Dennis Tajer, an American Airlines pilot and spokesman for the Allied Pilots Association, said several members of his union met with Boeing's lead engineer and chief test pilot for the 737 MAX on Tuesday in Fort Worth, Texas. He said they quizzed the Boeing experts on how erroneous readings from a single sensor could trigger the nose-down command. American Airlines pilots who were already familiar with the 737 got 56 minutes of training on a tablet computer when learning to fly the MAX, and "it seemed to suffice," said Tajer, who is a pilot himself, "but clearly there is more to this aircraft." A Boeing spokesman said the company always examines aircraft design and operation after any accident or incident. 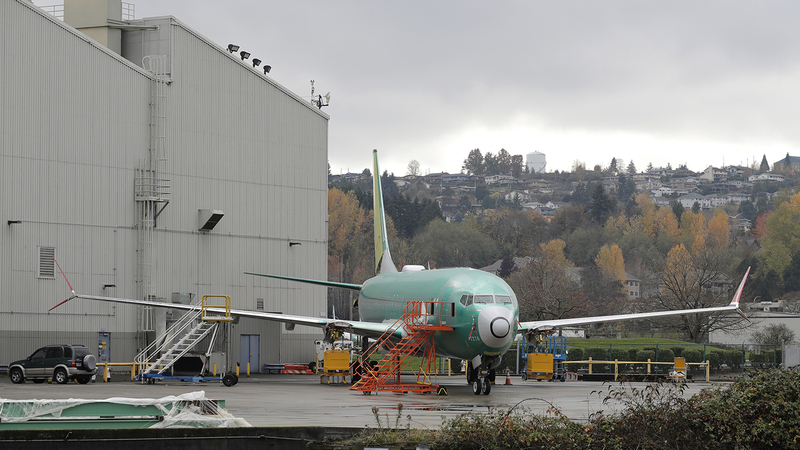 "Boeing continues to evaluate the need for software or other changes as we learn more from the ongoing investigation," said the spokesman, Charles Bickers. A spokesman for American declined to say whether the airline had agreed to the union's request for more training, saying only that the airline was working with the union. United spokeswoman Megan McCarthy said, "We have the proper training in place for our pilots." At the end of October, Southwest had 26 Boeing 737 MAX jets, American had 16, and United Airlines had seven, according to Boeing figures.